Inder Loves Folk Art: Baby doll diaper. Joe has a baby doll. I got it for him because I think it's great for both boys and girls to play with dolls. But honestly, it's not his most treasured toy. Baby has spent most of his life buried somewhere in the backyard. Occasionally, Joe unearths him with one of his far more treasured toy excavators. Recently, however, Joe has shown a bit more interest in playing pretend with his "baby." Baby has been carried around the house a little, and even put on Joe's potty. Coincidentally, my midwife recently suggested getting Joe a baby doll, diapers, and maybe even a little sling for the baby doll, so that Joe can practice baby care before our real life baby arrives later this summer. This seemed like a sweet idea, even if I had a hard time imagining Joe nurturing something that wasn't construction equipment. Anyway, last night, I was having a hard time with my other work-in-progress, a maternity top in diaphanous (read: impossible to sew) jersey and needed to take a break. So I made Joe's baby doll a diaper. Poor baby (who is an anatomically correct boy, by the way!) has been completely naked for a long time now. Really, common decency required that I make this diaper. It's just a simple affair. Two layers of flannel and some sew-on velcro. Here's the back view. I could probably perfect the fit, but seriously? It's a baby doll diaper. I got the general idea of what shape the diaper should be from this helpful tutorial, but I ended up drafting my own pattern piece for Joe's very small baby doll. 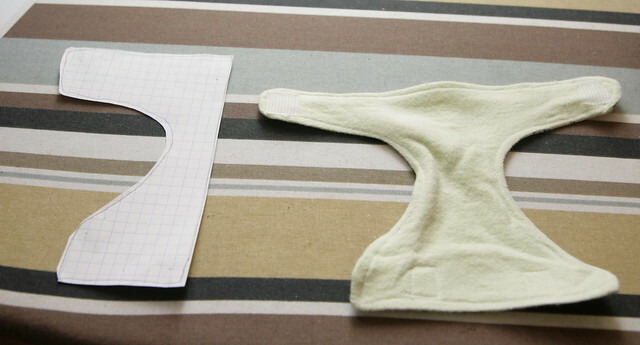 For anyone wanting to make baby doll diapers, here is the general shape. Even with drafting the pattern piece myself and trying out one diaper that didn't work, making this took less than an hour. With all that out of the way, I'm pretty sure I could make a diaper in 15 minutes or less. I may make a few more closer to my due date, so that Joe can change his baby's diaper when we change his baby sister's diaper. Of course, that assumes he is the least bit interested in such things. When I showed Joe his babydoll with a diaper, he shrugged and ran away. Later, he came back to it and said, "baby wear diaper! baby PJs?" So maybe I should make baby some pajamas. I never liked playing with dolls either, but then I never had one that came with an AMAZING MONKEY DIAPER! I love the idea of mr. baby just occasionally gaining more pieces of clothing, as the mood strikes. Like, huh, mr. baby has a bowtie now! Neat. Well that is the cutest lil diaper ever. How sweet that he is beginning to nurture the doll. When I got S one before L arrived he would take it by the head and throw it, jump up and down on it, bite it. lol Needless to say I was horrified that he seemed to be attempting to kill the baby. But now he's super cuddley with it and some of that is translating to his real life baby sister lol. It's a good teaching tool! so cute. love the monkey print :) pjs are in order..
that baby doll has the best rolls! and all diapers should be covered in monkeys and bananas if you ask me. so great! So cute ~ you're going to have to knock out a pair of jammies to match! Baby has washed up pretty well for being buried a lot! Heheh. You may have just made yourself a whole other baby to clothe now! Baby doll came in the bath with Joe and got the full treatment! Including getting his "hair" combed while Joe said "ouch ouch ouch" on his behalf. What a super cute chubby baby! Mind sharing where you found an anatomically correct boy, we could use one. I love the diaper, Jude's favorite baby is rather large so she just wears newborn clothes. Sorry, I kept meaning to examine Baby for a brand name and just now remembered. He's a Berenguer doll. They make anatomically correct boys and girls. Um, that is the cutest thing that I ever saw! Tiny little baby monkey diapers! On a quasi-related note, I ended up getting O a doll to try to help with the baby transition. She seemed excited at first and began to play with the doll saying "this is my little sister" and laid the baby doll down on the bed next to her. She then yelled "get out of my bed little sister" and pushed her on the floor. Because I have a totally sick sense of humor I couldn't help but find it somewhat humorous. I think we're in for some good times over the next couple of weeks! Adorable!!! It's interesting that Jo would want the baby to use the potty but have no interest in it himself. Maybe he's using the baby to feel out new and potentially uncomfortable situations? Eh, i'm sure it will happen, just like his vocabulary, all in good time and all at once when you're least expecting it. Gotta love that little boy for keeping us on our toes and in constant laughing good spirits. We got my older son a boy doll when our youngest son arrived, as a present from his new brother. He loved it and I think it really helped. I love the diaper you made - that's such a cute fabric. My boy plays with a baby doll sometimes, but he's used to seeing me with a baby. I've been meaning to make clothe diapers for the baby for ummm... two years? Three? He recently saw a television commercial for a baby doll that sneezes and then you give it medicine and said he wanted one, and I was totally going to buy him one until I realized that if he was a girl I'd say, no way, it's 40 bucks! Beautiful candle, I must have a go one day at doing one of these. Christening gifts . Spring Top Sew-Along: "Rie" Top. Back to my old stand-by.